This year, Carluccio’s has taken all the work out of Christmas shopping and entertaining. The 40-strong range of seasonal products, made specially for Carluccio’s and specifically for Christmas, includes a carefully edited list that showcases 12 must-have festive essentials that will be all you need in your cucina or sitting under your tree this year. From the hero products that make Christmas, well Christmas, through to regional specialties and definitive dinner table staples, each has been identified as being quintessentially Italian and the very best of its kind. Whether looking for indulgent gifts for someone special, thank-you gifts for teachers and colleagues or something that puts the sparkle on your own Christmas table, Carluccio’s has it covered. This year’s jewel-toned and gold-trimmed gift boxes come with individual illustrations inspired by where the products come from. Every box is individually numbered reflecting the exclusivity and limited run of these beautifully crafted products whilst stocking fillers, advent calendars and Christmas crackers are wrapped in bold, vibrant prints, reflecting the joy and excitement of the season. 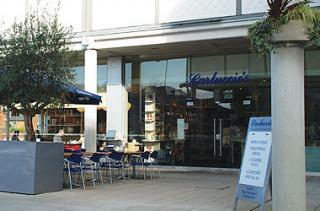 All of Carluccio’s products are available in-store. PROSECCO E GIANDUIOTTI (£26.95) – a celebratory gift box filled with gold foil-wrapped gianduiotti, traditional chocolates made with the best local hazelnuts, and accompanied by a bottle of prosecco. PASTA E SUGHI (£29.95) – a gift box packed with a week’s worth of pasta and sauce featuring a selection of seven of Carluccio’s most popular varieties. A fabulous gift for anyone passionate about pasta. LUI E LEI (£23.95) – for him, for her, for you; no Italian home is without this classic double act of oil and balsamic vinegar. VIN SANTO E CANTUCCI (£25) – a fourth-generation hilltop baker in Tuscany makes this 100 year-old cantucci recipe using Italian almonds and local honey whilst the Vin Santo comes from the vineyards below. CHOCOLATE GRISSINI (£12.95, 350G) – always a sell-out; these savoury dark chocolate breadsticks are made by fifth- generation chocolatiers and only sold by Carluccio’s at this time of year. CLEMENTE IN CAMICIA (£16.95, 300G) – plump and bursting with juice, the clementines are enveloped in two layers of dark chocolate. F I C H I R I C O P E R T I ( £ 9 . 9 5 , 1 8 0 G ) – hand-weaved baskets are made throughout the year in a quiet, sleepy Calabrian village. Local dried figs are baked and hand-stuffed with orange peel and walnuts before being lovingly placed in their mini manger. T O R R O N E ( £ 6 . 9 5 , 1 1 0 G ) – a special treat enjoyed across Italy every Christmas, Carluccio’s is made with Sicilian pistachios and Puglian almonds by torrone master Nazareno, just outside Naples. PANETTONE TRADIZIONALE (£16.95, 1KG) – winner of numerous awards, this part bread, part cake is made to an exclusive recipe using plump fruit, candied peel, natural yeast (from a starter dating back 100 years) and finished with a hazelnut glaze. PANDORO (£16.95, 700G) – Italians have two stars every Christmas; one atop the tree and another in the form of a star- shaped Pandoro taking pride of place in the centre of the table. BACI DI DAMA (£17.95, 875G) – these Piemonte biscuits are made with butter, hazelnuts and chocolate with each ‘lady’s kiss’ put together by hand. AMARETTI (£7.50, 250G) – Antonio Carluccio remembers the way amaretti tasted as a child, and Carluccio’s has tracked down the same local, family-owned bakery to ensure a traditional, authentic taste. II GRANDIOSO HAMPER (£235) – This impressive collection is a lavish gift for someone special, complete with ‘The Magnificent 12’ alongside some of the best-selling pasta varieties and sauces that come all wrapped up in a beautiful hero hamper. Available exclusively online from the end of October. PANETTONE AL CIOCCOLATO (£16.95, 1KG) – the same recipe as the classic but with the sweet addition of chocolate. PANDOLCE (£9.95, 350G) – this aromatic fruit and nut bread hails from Genoa and is perfect with a glass of chilled prosecco. P A N F O R T E ( £ 9 . 9 5 3 0 0 G ) – this traditional fruitcake recipe dates back to 13th century Siena in Tuscany; a delicious gift best enjoyed with a coffee or dessert wine after a meal. BUON NATALE ADVENT CALENDAR (£11.95, 230G) – countdown to Christmas with an advent calendar featuring a foil-wrapped chocolate character behind each colourful window. ALBERO MASSIMO (£4.95, 130G) –aChristmastreeburstingwithfestivechocolatecharacters;makesagreattablesetting or gifts for youngsters and the young at heart. ALBERO DI CIOCCOLATO (£8.95, 200G) – individually hand-decorated milk, white and dark chocolate trees. GIANDUJA CHOCOLATE BARS (£3.95, 100G) – beautifully wrapped in a choice of three equally vibrant prints; treat someone to all three for a fabulous looking (and tasting) gift. CHOCOLATE COIN (£2.50, 90G) – use the giant coins as unique Christmas table place settings or stuff in a stocking; a selection of smaller coins also available in a net bag (£2.95, 140g). CHRISTMAS CRACKERS (£15.95, 6 CRACKERS) –pureunadulteratedfunandfilledwithtwogianduiotti,apaperhat and a fun Italian trivia game. LINGOTTINI (£6.95, 145G) – rich, dark chocolates with a melting centre in flavours of coffee, amaretto and hazelnut. Professional and reliable nail salon, also offering pedicures.